How to save yourself or your workers from the danger of 200 joules? You’re into construction. You’ve machines, labour, and enough capital. This is great. Now close your eyes for a minute and imagine a brick falling on your toes from a 10th storied building. Ouch!!! You’re gone, aren’t you? Can you feel the pain? And see the blood coming out like water comes out of your bathroom tap? Your workers work all day on the construction sites. And you’ve got them covered for head injury and feet injury. But are the helmets and the shoes good enough to bear the impact that a brick falling from a 10th or 11th storied building would have on the head or toes of your worker? Chances are the safety gear isn’t that safe. Accidents never tell you that they are on their way. They just happen. And the best you can do to prevent injuries or even deaths on your construction sites is to strongly protect your workers. 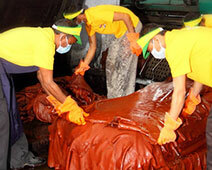 The top industrial shoes manufacturers in India continue to make safety shoes safer, lighter, and more comfortable. At Liberty, we’re proud to mention ‘Warrior Professional Gear’ as one of the leading safety shoes brands available in India for the construction workers. The metal toe caps do the magic. So what we basically do is put a metal cap / steel cap / alloy cap on to the toe section of our shoes. We use high grade metal to further the safety capabilities of our safety gear that is Warrior. The metal toe caps protect the wearer from an impact of up to 200 joules caused from falling objects such as bricks and stones and other stuffs that might fall on the feet of your construction workers. Apart from this, we continuously innovate and experiment to make the shoes lighter, safer, and more comfortable so that work forces across the world can go after their work with absolute confidence. Fine leather, direct injection P.U. 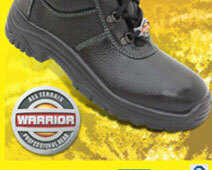 soles along with high quality water proof membranes, and foot beds make Warrior an all-weather friendly safety shoe. If you’re contemplating buying shoes from the leading industrial shoes manufacturers of India, get in touch with us.